The experience with the knitic board as a shield on an Arduino Due for connecting the machine knitter KH-940 with a laptop was not very positive. The board is very fragile. Connecting and deconnecting making it needing constant repair. After the e-textile summercamp a week was spent on making a new board, connecting the ULN2803’s and programming the Teensy 3.1. 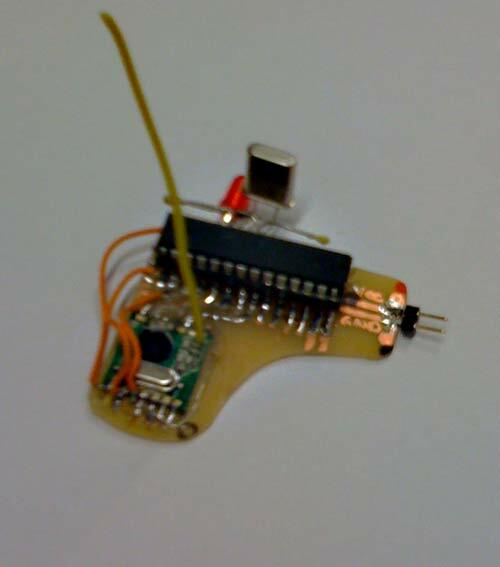 The Teensy 3.1 microcontroller has enough pin’s, it is small and cheap. Because the Teensy is running at another speed, 24Mhz, the delay’s between the Serial command sent from the laptop to the Teensy had to be altered. 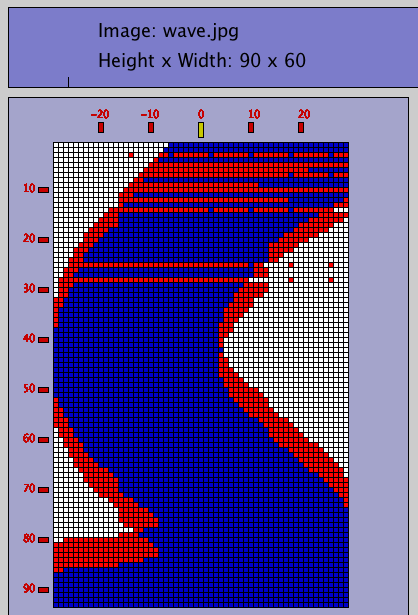 The mistakes in communication in red, the red borderline below indicates the mistakes in lines. The mistakes in lines are removed, but inside the line, there are still mistakes in pixels. 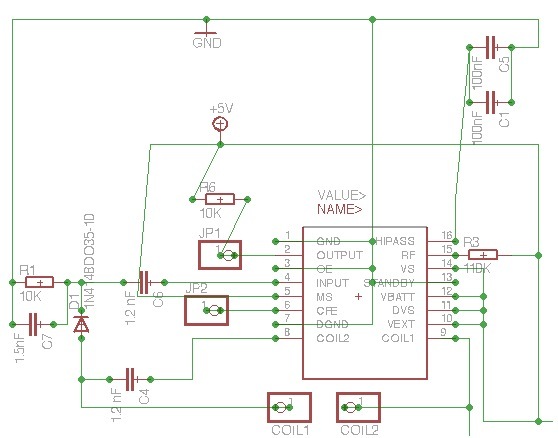 Making delays between Serial asking the laptop for data and receiving the data larger, the picture is received without mistakes. The board connecting the ULN2803’s with the Teensy had to be adapted too, because the Teensy is working at 3.3V while the sensors of the KH-940 require 5V. This 5V is taken from the KH-940. The Teensy runs on the USB. Also the Teensy is not resetting if Processing is started, like it does witht he Arduino. So the initialize function had to be refined. The board with 2 extra potmeters to make the analog read run at 3.3V. Last year in 2013 I joined the lobotomy workshop of http://www.knitic.com/ in Bruxelles. We made this knitic board (now called the first version) and did some experiments, which failed using my board on a KH-940. But in the end I was happy anyway, full of plans to make this work! It took a bit of time! On the school (www.wdka.nl) we had the KH-940 knitters but I didn’t want to test too much on these machines for the students. After a fail I abandoned the experiments. Before the summer I bought my own Brother KH-940 which I tested during the etextile summercamp: http://etextile-summercamp.org/ I discovered much more than the Nordic knitting technique! Back in Rotterdam, besides discovering patent, slip, tuck, ajour (knitting a sock too 🙂 ) I could try to re-lobotomize my knitter. Then (after lots of frustration) I analyzed this board and by measuring I discovered that the PIN 2 of my Arduino Due board was always GND. Since this was a PIN used by the needle count it was obvious important signales were missed. This was easily fixed by assigning another PIN. I decided to program my own software. That took some time, analyzing the sensor information and building up the Arduino software in combination with the Processing software. 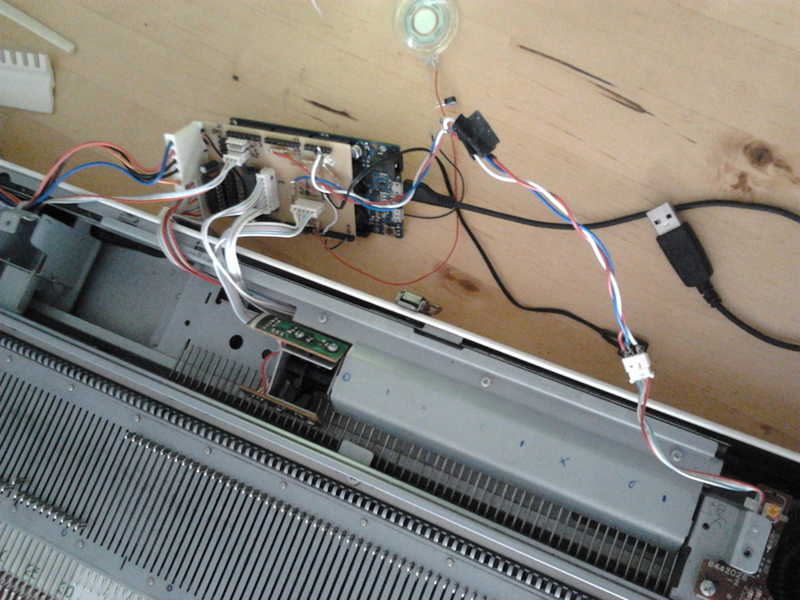 The main point discovered was that the sensor information from the knitter was lost if you sent too much information to the laptop. The knitter is sensing a lot of stuff and we need it all. So in the end the information sent to the laptop is minimized as much as possible. The second point was getting the offset right for the solenoids. This took some figuring out, because the belt and the carriage have several ways to connect. By discerning between four ways to combine carriage and knitter apparently all possibilities were tackled. 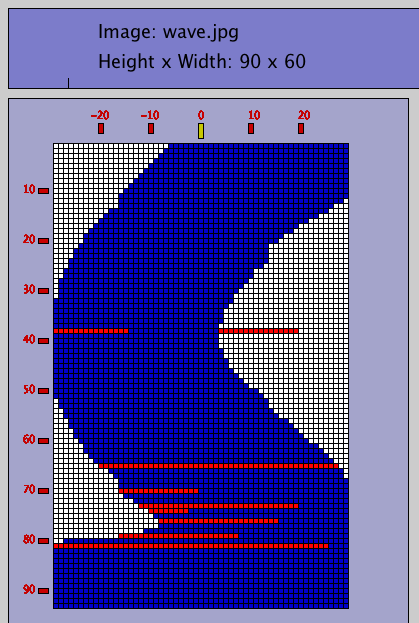 The processing sketch has a basic interface, showing the image and the tours you are knitting. A few nice sounds accompany you while knitting and signaling the end of the knitted image. Hardware board: basically arduino Due + connections to the KH-940 sensors and 2 ULN2803. See: http://www.knitic.com/download/, although their board is much more nice now then mine, which was their first version, but is works. And they have developed this fantastic double bed version! Basic interface made with Processing, showing the image, and the tour you are knitting. Needles are set according to the knitted tour. My fascination is to use the “other” possibilities of the KH-940 for datavisualisation: the slip stitch, the patent stitch, the tuck stitch, well that is starting to become possible…..see next post). The software can be found here, but as mentioned there is a dependency on laptop, so be careful! First version not documented yet. Still testing!!!! Open source is a bit like Fast Food! Better also do some Slow Cooking! We bought RFM01’s RFM02’s and RFM12, a few month ago. Eventually the RFM12’s worked with the library of jeelabs.com. We modified this library a little bit to seperate it from the Ports.h. 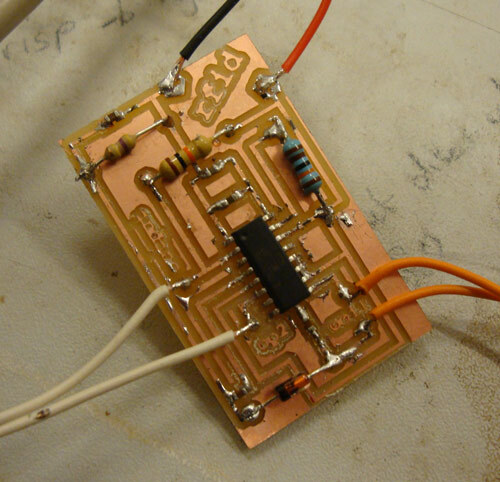 The RFM12’s communicated very well, and we did (and will do) several first projects with these transceiver. (see former posts) Although it is sufficient to use these RF12’s we still had a bunch of RF01’s and RF02’s. So we set out to get also these senders and receivers working. But the RF01 nor the RF02 worked. Finally after trying A tiny remark in the descriptions of the RF01 and RF02 explained why: before the datatransmission you have to send the command 0xC6 and this cannot be done SPI. SO this is why the examples use different (slower?) methods. see for instance: http://winavr.scienceprog.com/avr-gcc-tutorial/serial-peripheral-interface-spi-of-avr-microcontrollers.html, but more to the point just the datasheet of the atmega168. There you can also read about the interrupts. 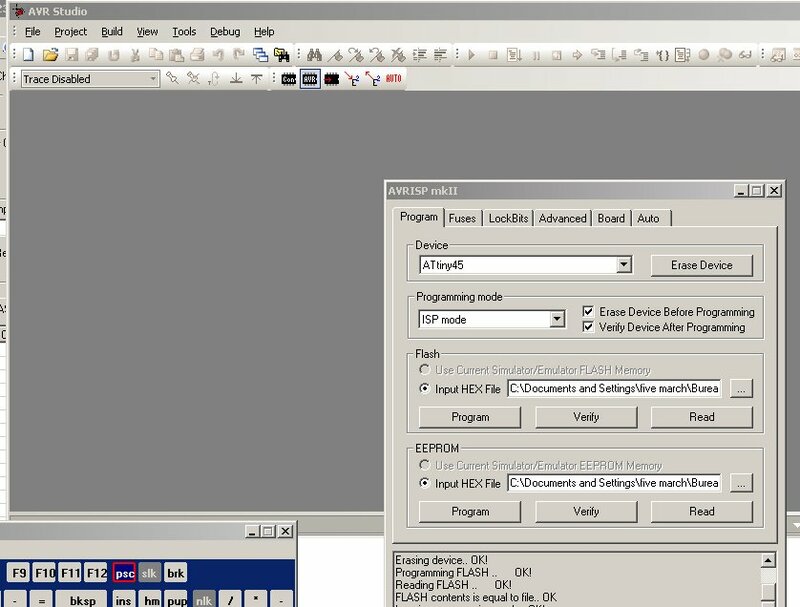 Even before the RF12 lib of jeelabs.com we found the RF01 and RF02 examples of Benedikt on http://www.mikrocontroller.net/topic/65984#541030 but the first time around these did not function. Now, with more experience in settings and wiring these examples worked. We got transmission using these slightly modified avr projects. The frequency is 434 MHz with the idea of also talking to the RF12. This last attempt failed, are there other settings? We used the RFM01_Eva (together with RFM02_Eva, and RFM12_Eva) to compare all kinds of settings. The programming was done using AVR Studio 4 using a AVRISP mkII. 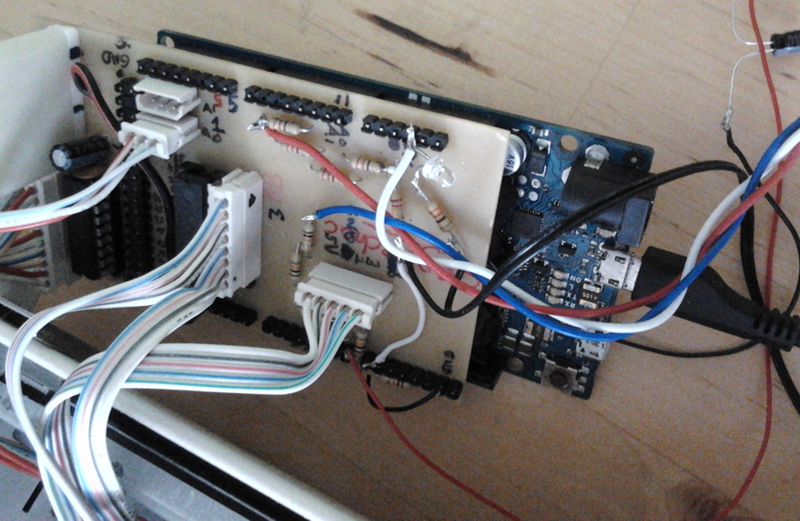 We have made our own experimental board (minimal components) but also used the arduino with the programmer. Then we made a first version of RF01 and RF02 libraries for the Arduino (arduino 18). This is relatively easy and gives us the freedom to include the wireless stuff in other arduino projects. 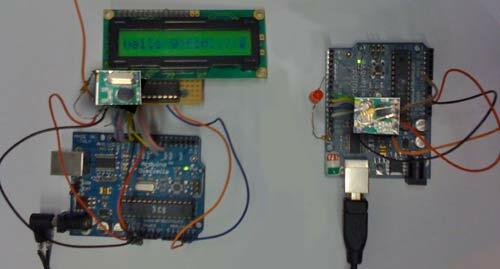 Then we had these two test (arduino-) projects used to send and receive a simple text. (The receiver uses the Liquid Crystal AT161.) The pins used can be found in the library scripts. Now we face the question: do we facilitate lots of fancy stuff and make the library less accessible or do we just provide a testing base for everyone to be extended? 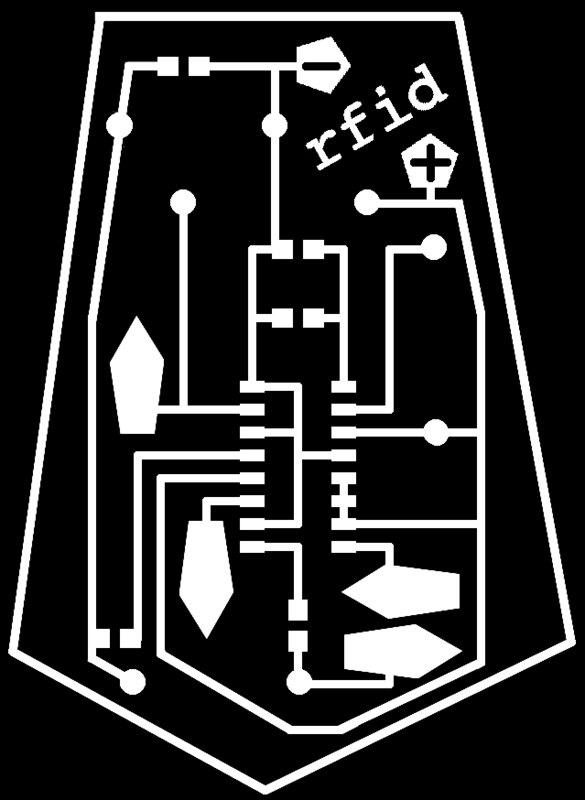 🙂 the answer is this: sketches of the RF01 RF02 libs, working in the arduino version 018 can be downloaded here if you want another frequency than 433 you have to look at the code in the lib. 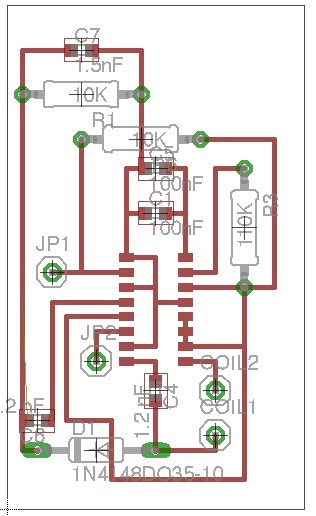 To make the assignment for the ATTINY44 more fun, I am racing to get another board working with a RFID reading chip. 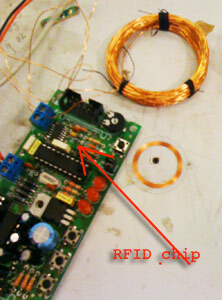 I have done experiments with the Phidget RFID reader, which works perfect of course but is expensive, around 50 euro’s. 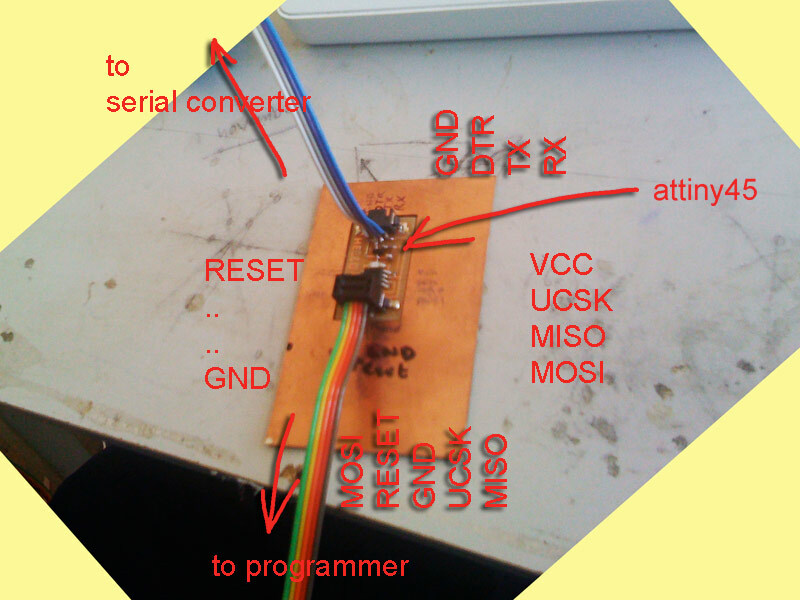 Then I found the at http://www.pollin.de a rfid kit of 15 euro’s, which I built and tested. I made the coil winding myself it was very sensitive, one more or less made a big difference in response. 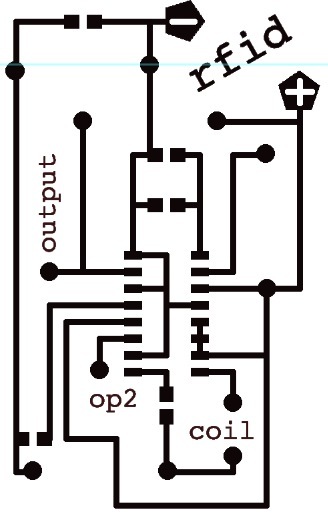 The circuit was based on the ATMEL datasheet of the U2270B. So I realized much of the board was not needed, buying this chip for 3 euro’s at http://www.pollin.de. But the capacitators needed are not so current?? Anyway I had to compromise a little bit with the parts. 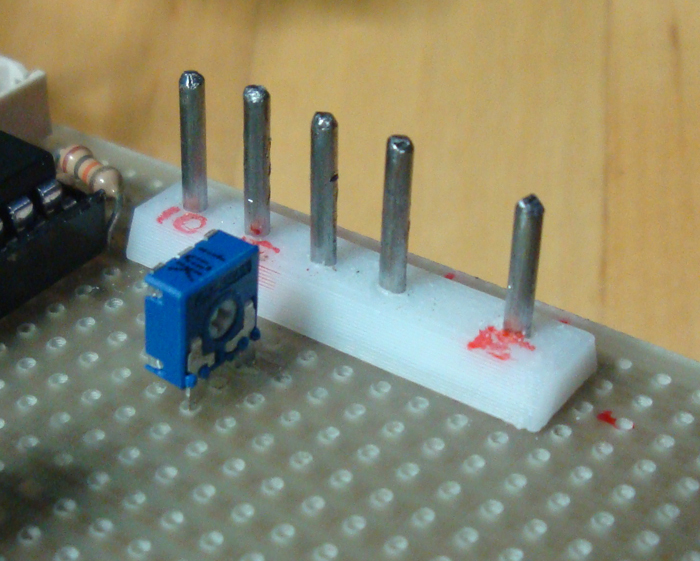 I reprogrammed the attiny2313 in BASCOM. In BASCOM there is a function (readHiTag) which reads the data coming from the CHIP and makes them into the 5 HEX numbers needed. Making the board for the MODELA milling. U2270B is not in the library of Eagle. I had to construct the U2270B part in EAGLE and make the board. Because I was using only one layer I puzzled around with “big” resistors to make some crossings. 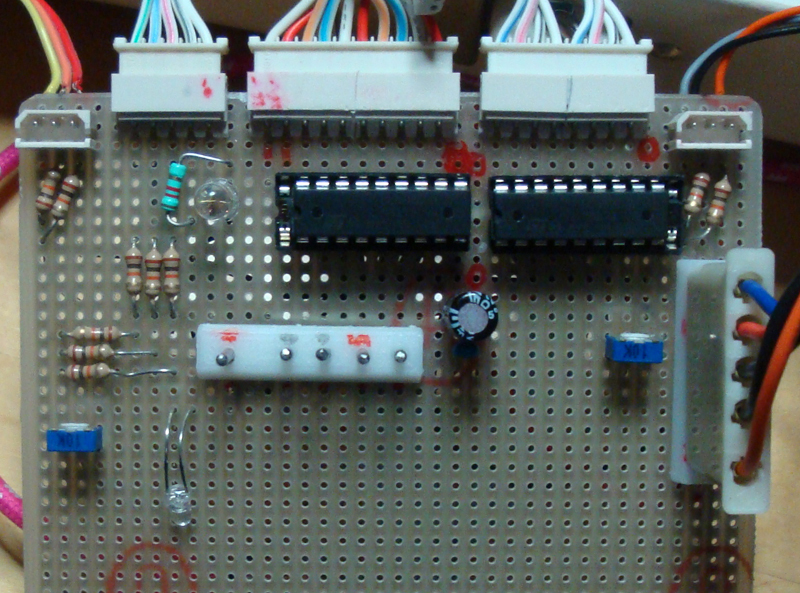 Here are some pictures of the board and the schematics, files will be added if all is tested and works. I printed the board on paper to see if the parts would be fitting. There were a few problems: the capacitor below the chip was too close and the connections with the coil were too small, so the copperfoil came off from the board. I wanted to do something more with the button board. 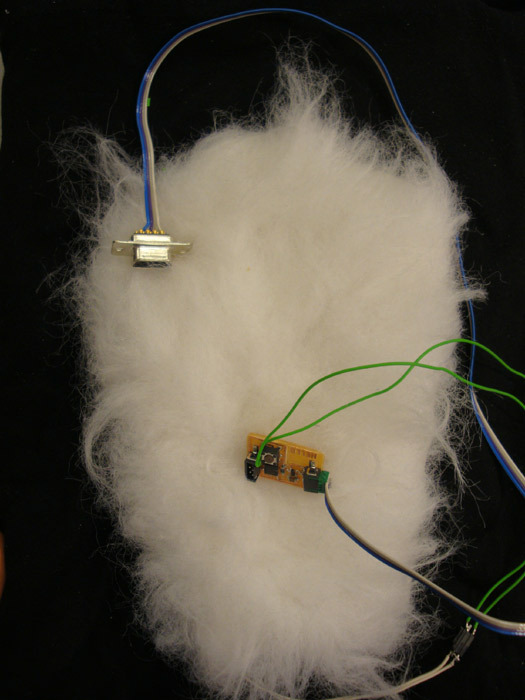 As a contrast to the very technical looking board I made a soft button of artificial fur and connected it to the board at the small button. In FLASH i used some actionscript to get the input from the socket and started a sound and a text at button-down and started a small video bit at button up. The text displayed in the textfield is actually coming from the board, this text is in the HEXFILE, of course it is very easy to make the text in FLASH too. What to do and how to check if a board does not function? First of all check the cables. With a voltmeter check the input on the serial connector there should be 8-9 Volt on the right to small wires. Then check if this cable transmits the voltage to the board. So first check if the voltage is on the steel parts of the connector. Then if the voltage is passed through to the copper lines of the board. Then check if the other pins of the chip are connected to the second connector. Pin 5 should be connected to the left pin of the connector (MOSI). The pin right to this should be connected to pin 1 (RESET). The middle pin of the connector should have resistance 0 with the Ground, GND pin 4. 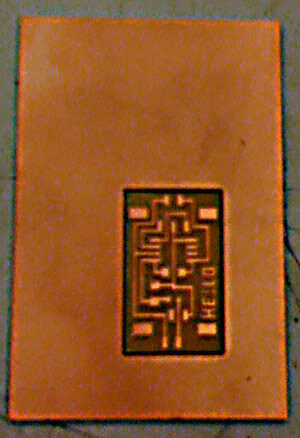 The pin right to the middle pin must be connected to pin 7 of the chip. 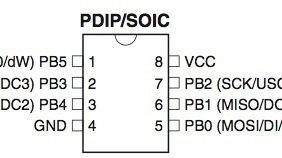 And the right pin of the connector is the MISO, pin 6. Then check if the left pin of the connector is having resistance “infinite” with the middle pin of the connector. Also do this checking against the ground (middle connector pin) to the pin to the right, MISO. I had a shortcut of the MOSI with the GND, very strange! The programmer warned me about it, and it was right. Now the programmer, or avrdude cannot complain anymore! After we had made a board with the Modela we had forgotten our frustrations. Of course we mixed up inches and centimeters once, measuring the X in inches and the Y in centimeters. Surprise! The Modela just followed orders and didn’t think itself…so we had another mistake added to our formidable list of mistakes. But this is learning! We had a board, although it was still on the bigger copper plate, not cut out, this was proving difficult for the combination Modela-myPerson-FABLAB Amsterdam. Other students had the same problem, so we decided it was the MODELA….. 🙂 ……Blaming others is so easy! Indeed it was our mistake! We lowered the head too much, so the Modela could not get deep enough to mill out the board. 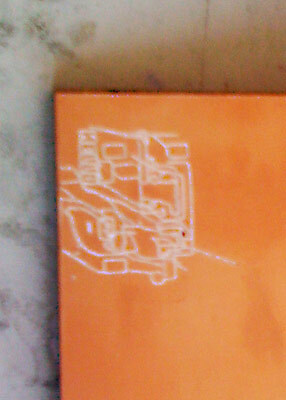 But the board on the copper plate was ok for this test, since I could use the surface making notes on the ports etc. Then the difference in parts between Europe and California tricked me in a roundabout way of working. I did! And also: i have a laptop running two OS: XP and MACOS. I have to prepare al my stuff already in these two OS, so I didn’t install Linux. And my laptop has no parallel nor serial port! Either go to the FABLAB every time for every part and programming, or…DIY. 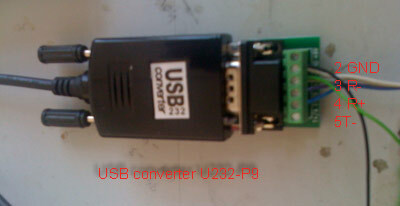 In a program called 232ANALIZER I could connect to a port. Then connecting pins 2 and 3 of the serial connector I could see it worked, sending back what I sent in. Then I had to make the cables. 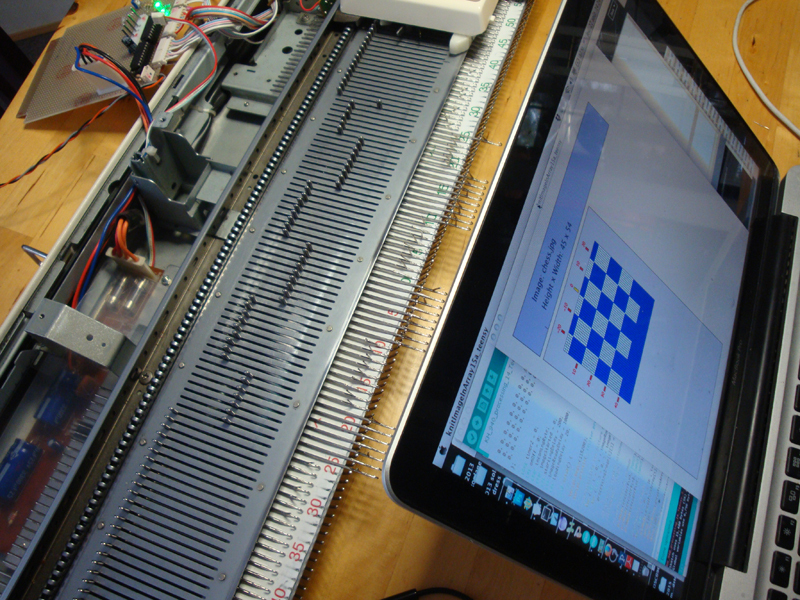 Not able to use the parallel port I had to use my programmer AVRISP mkII, in combination with AVR STUDIO. 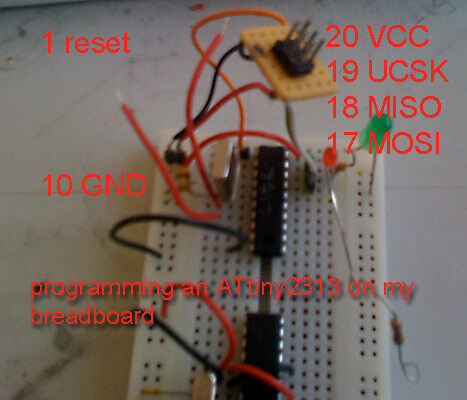 I already programmed a ATtiny2313 on a breadboard, so making the several connecting cables took me a few houres (checking and double checking) but then the ATtiny45 on the board could be programmed. First I was stealing power form the USB port, but this didn’t prove enough for the progammer – chip combination, or the circuit was consuming energy. So I used a slightly more powerful pack of batteries and the programming went well. Later on I programmed again, using the Serial port (converted from USB). 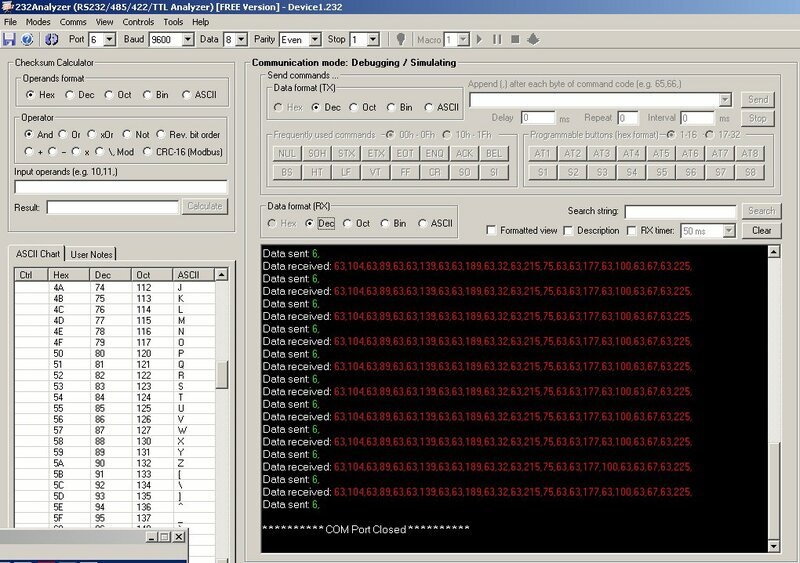 In 232ANALIZER there was clear evidence that the chip was sending, but the data were nonsense. Fiddling with the setting make me set the party to NONE and then the hello world text appeared. Next step will be cleaning the process: making more boards, and possibly re-programming the chips. 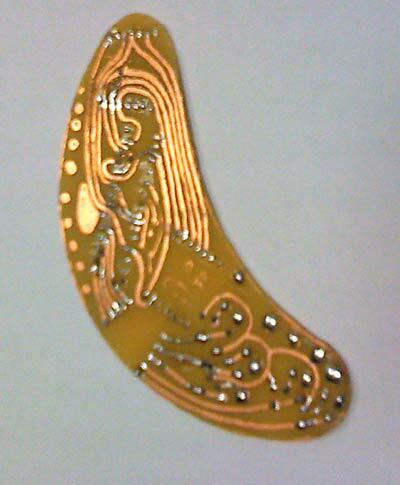 making PCB’s using the MODELA: great! some Linux, I have to install LINUX somewhere…but YIKES, maintaining three OS’s!!! having wires, some pins etc in my studio, so being able to work independent from the tools in the lab: DIY for ever! 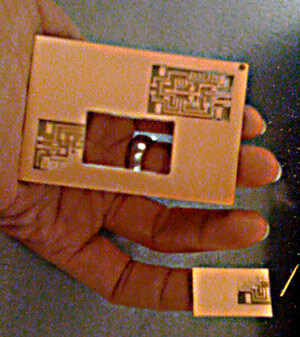 What can be done: making my own PCB’s, needed because I have to deliver an RFID module. 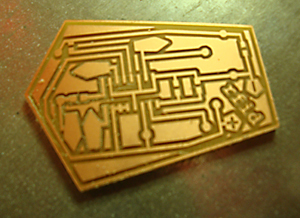 The chip is ready, but I have to design the right PCB (pentagon shape). 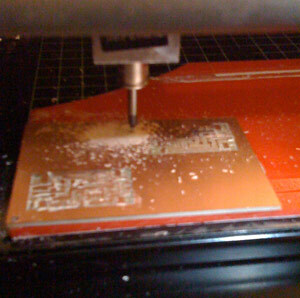 Going on cutting circuitry with the vinyl-cutter. In Amsterdam we did a lab-session for learning how to handle the Modela for making PCB’s. First a new computer was installed with UBUNTU but it took linux experts 1.5 houres to NOT get the USB port speaking to the Modela. Then Alex recovered the slow old computer with a serial port. This thing worked, although we had to repeat the phrase “This thing goes very slow indeed!” every time we tried milling another board. Yes every time because we didn’t really get one done decently. The first went well, but the outline failed to cut out through the board. 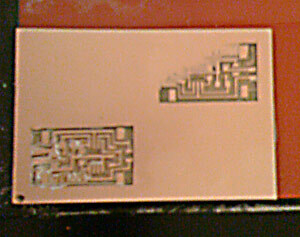 The second one went wrong because we wanted to be conscious of environment and not wasting material, so we tried to do several on one copper plate, but the base was not really horizontal, so the corner gave us a tilted version of the engraving, see image. 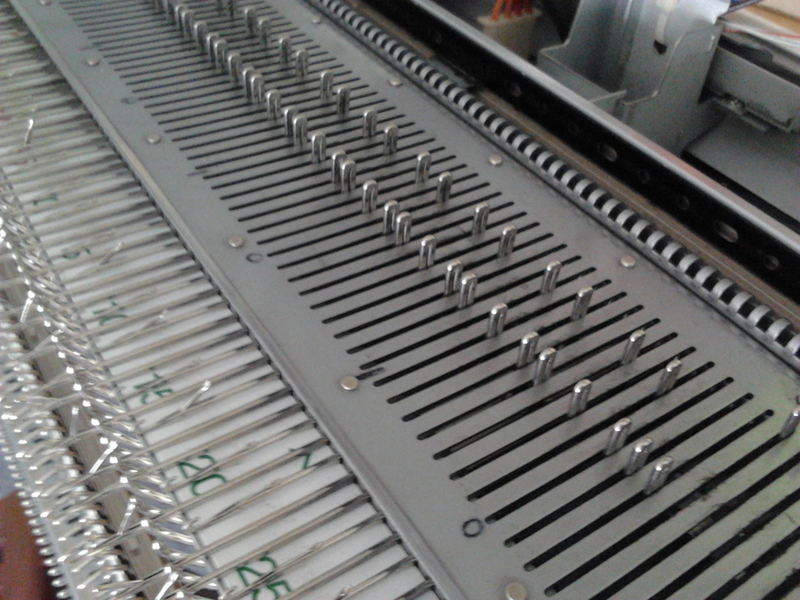 Then slowly the screws for the millers became stressed…and we could not really fasten them properly. Then we did the last one, wanted to mill it out with the outline, but we forgot that we were doing economically in the corner, it cut the thing out in the middle. So all ended in tragedy (for us) and comedy for the reader of this blog…. ok, but only not deep enough! ok, but the outline was on a different spot , right? Maybe the one in the corner is still usable…. we still pamper our dreams of milling perfect PCB’s, and indeed, making 5 sided PCB’s, to be fitted to a very intelligent chair…. Most of the problems were caused by the lowering of the head of the Modela: it was lowered soo deep that the Modela had no space left to mill out the board. It took some time to realize this was the cause of our failures.